I’ve been riding for 16 years – 95% of that time has been spent commuting. Firstly in and out of London, then later once I’d moved Stateside it was between where I live in Simi Valley and the job 45 miles away in El Segundo. I ride year round, day and night; come rain, hail or shine. I’ve experienced just about every conceivable problem during that time so here’s my list of essential tips and gear for commuting successfully on two wheels in varying weather conditions, in every traffic scenario imaginable. I hope you take away some (if not all) of the things listed here with you! Like any task, use the right tools for the job. Commuting regularly through heavy traffic in a variety of weather conditions calls for something comfortable, practical and economical so it’s probably a good idea to leave the R1 in the garage and use something more suited to the task at hand. Go for something that gives you as upright a seating position as possible – this means long journeys will be far more comfortable as it saves strain on your back and arms and will also give you far superior forward vision. Carrying luggage, good fuel economy, comfort, weather protection, ABS brakes and traction control are all desirable traits when picking a good commuter. Commuting daily in all sorts of traffic conditions, gone from home for many hours and changing weather conditions all mean you’re going to need to carry some stuff with you. Some bikes come with hard saddlebags/panniers included which are great. If yours doesn’t, you’ll need to invest in some storage. If you can – plump for a top box. 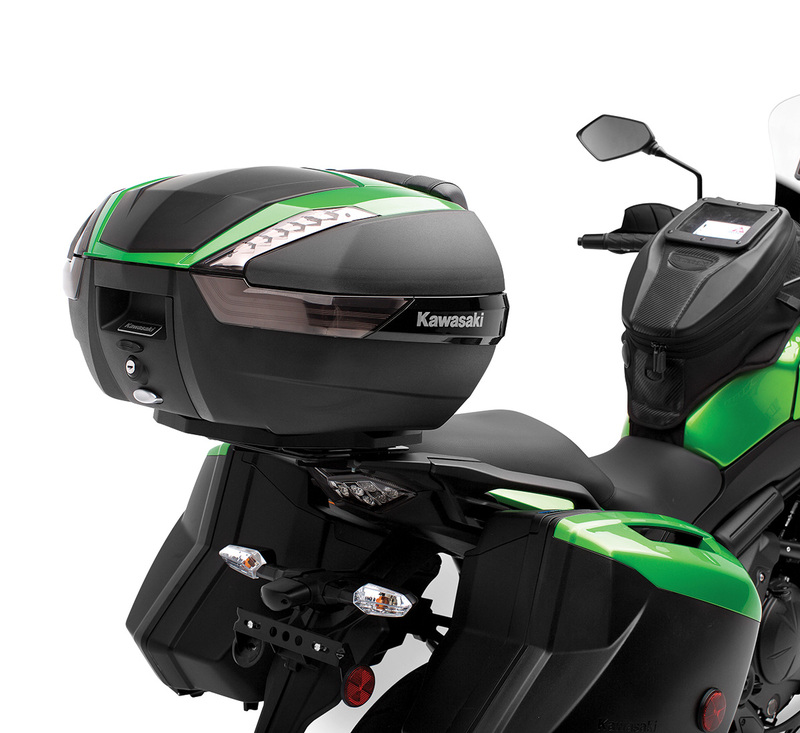 Mounted on a bracket above the rear wheel, these are the largest of all the motorcycle storage options available. Mine is a whopping 47L capacity (more than both my two side hard bags combined!) and I can comfortably fit a full backpack plus wet weather gear etc inside. These are at the top end of the price range though, so if budget is an issue, go for a tank bag. These strap to your fuel tank and, whilst not as roomy as the top box, are still good enough to fit some wet weather gear, a laptop, phone and a packed lunch. 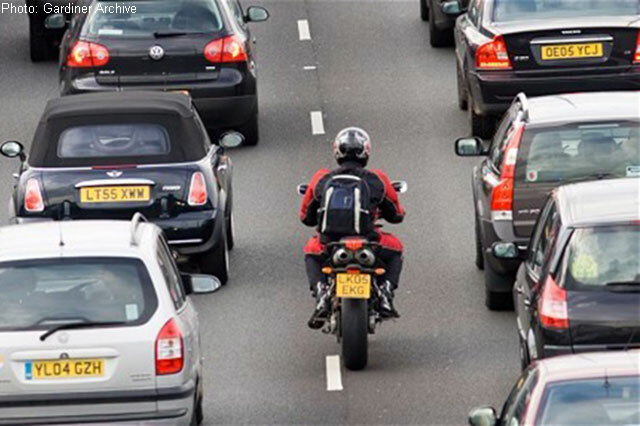 You should avoid using a rucksack/backpack altogether, even if it’s one designed for motorcycle riding. Why? If you’re in an accident wearing a backpack, you’ll either land or roll on it, which increases your chances of spinal injuries and whiplash. Plus items inside the rucksack could impact the spine and other parts of your body, causing more damage. A rucksack also impedes sliding on your back which could force you to roll more. One piece of kit often missing from most commuter’s collections happens to be the most important – a tire plugger kit. If you commute daily, you’ll be racking up some serious miles, so the chances of you picking up a puncture increases dramatically. The roads are full of all manner of sharp objects that can rip a hole in your expensive tire. A punctured tire on a car isn’t too much of a problem – all cars have a spare tire and a jack in the trunk so you can have a spare tire fitted and be on your way fairly promptly. A puncture on a bike though is terminal, and this is where one of these kits becomes a true life-saver (not to mention serious cash saver!). There are a few options available here – but the best one we have found is the Pocket Tire Plugger from Stop and Go. 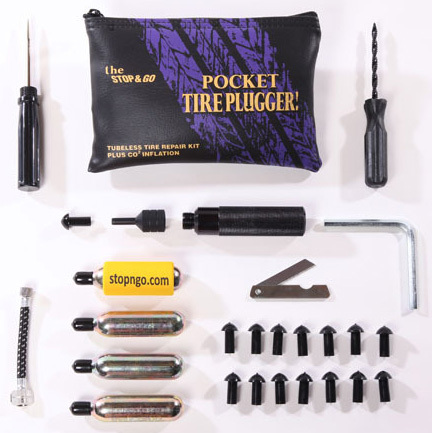 This comes in a small pouch so is easily stored in a tank bag or top box and lets you not only plug the tire with a permanent rubber plug/seal, but also comes with enough CO2 canisters to inflate the tire enough to get you rolling again, which will save you a fortune in tow-truck fees. If you commute daily you’ll also spend some time riding at night so having a small flashlight handy could be a potential lifesaver if you pick up a puncture or need to find something in a hurry. Fortunately technological advances in LED lighting have taken a previously heavy, bulky item and reduced it to something you can fit on your keyring. Take a look at the Streamlight Nano Miniature Light. This punches out an impressive 10 Lumens, is smaller and lighter than your bike’s ignition key and costs less than $10 bucks. Riding regularly means you will be doing more than your share of wet-weather riding. What may start out as a nice, warm sunny ride to work can quickly turn into a cold, dark and wet ride home, so you’ll need to make sure you’re carrying some gear to keep you dry, as there’s nothing worse than getting soaked on a bike at 70mph…! There’s a dizzying array of wet weather motorcycle gear on the market so we’re not going to list everything here – but you’ll want to carry a rain suit with you if possible. Failing that, a waterproof pair of overpants are great as they can slip on over your pants. Your jacket should either be waterproof, or if it comes with a waterproof liner, you can put that on before you set out. A good pair of riding boots should keep the worst of the rain out. Last but not least, a set of waterproof, insulated gloves stop your hands from getting soaked and numb. Even in hot places, it can sometimes be cold. If you add rain to that as well, there will be times when your hands will literally freeze, and that’s dangerous as cold hands are less able to operate the controls effectively. Invest in some heated hand grips – most manufacturers offer these as an optional extra, but there are also after-market options available. You may not need them often, but when you do, you’ll be oh-so-grateful for them. Always a good idea to carry some warmer layers in case it turns chilly while you’re at work. It’s no fun being freezing cold on a bike so having a sweatshirt or fleece handy to pull on before you set off will make your journey home far more comfortable. There are several reasons for wearing a balaclava under your helmet. It’s more comfortable, it makes your helmet fit a little more snugly and it wicks away sweat which prevents your helmet getting sweaty and smelly. This item from KLIM goes one further and adds a WindStopper to the bottom half (the top half is Coolmax). Anyone who rides in chilly mornings / evenings will appreciate the WindStopper – total protection from cold air / wind and fleece lined on the inside. If you are tired of cold face and frozen neck – this is an essential piece of kit. These heavy duty locks are small enough to carry in a top case or tank bag. They work by locking themselves through one of the holes in our front brake discs and are a visible deterrent to any impulsive bike thief. Not an obvious one this – but the only thing connecting the clutch lever to the clutch on your bike is a thin metal cable. If the cable breaks (which it ultimately will with consistent, heavy use) the bike becomes inoperable. A spare clutch cable is only a few dollars and can fit under your bike’s seat. You wouldn’t even need to thread it through the various housings if you need to swop it out in an emergency: just thread it from the lever, down through the front forks and onto the clutch mechanism on the right side of the engine. It’d be enough to get you to a repair shop or home. If you have a helmet with an integrated sun visor you can skip this one, but for the rest of us we either need to make the choice between riding with sunglasses or swopping our visor out for a darker one. 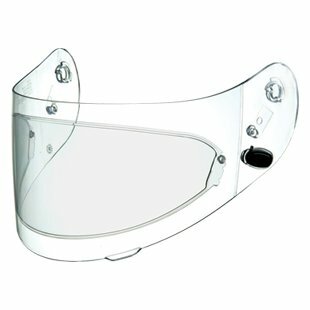 This is fine – except if you have to pull an unexpected late one at work, you’re now faced with a long ride home at night with a dark visor on… If you ride with a dark visor, try and carry a clear one with you. I’m kinda on the fence with this one. I don’t use one myself but I do see others wearing / using them. From a liability / proof-of-fault point of view I can definitely see the advantage. That said if it’s your fault your video can be used against you so…. These are plastic shell extensions that sit forwards of the two handlebar grips. They shield your hands from the worst of the wind, rain and debris that gets flung up in the course of daily commuting so are an invaluable and often inexpensive addition to your commuting toolset. Riding a motorcycle is loud. The wind noise and buffeting at high speeds is deafening. If you’re just out for a Sunday ride you can probably do without, but if you’re going to be subjecting your ears to deafening noise twice daily, save yourself from permanent, irreversible hearing damage and buy a box of ear plugs. A box of fifty is less than $10 and you’ll be surprised at how a quieter ride makes for a more relaxing, enjoyable one. A must-have for any commuter that rides in all sorts of weather is a PinLock visor. If your visor doesn’t support this, you can buy a Fog City insert from Amazon or any good bike shop. The two systems are actually identical – the PinLock lens is removable whereas the Fog City lens is stuck into place and can’t be removed (or if you do – you aren’t getting it back on again :-). The system works by basically adding double glazing insulation to your helmet visor. You add a clear plastic “lens” to the inside that is completely sealed all the way round. The air trapped inside acts as a superb insulator, thus preventing condensation build up so you’re able to ride “fog-free” in all conditions.